What has been rumored to be the greatest Zappa tribute band has come to CD in the form of the Zappatistas: a group led by guitarist John Etheridge and keyboardist Steve Lodder. The group was formed for a one-off live performance calling on the best of the current British jazz community to participate, including Annie Whitehead (trombone) and Ben Castle (alto sax). 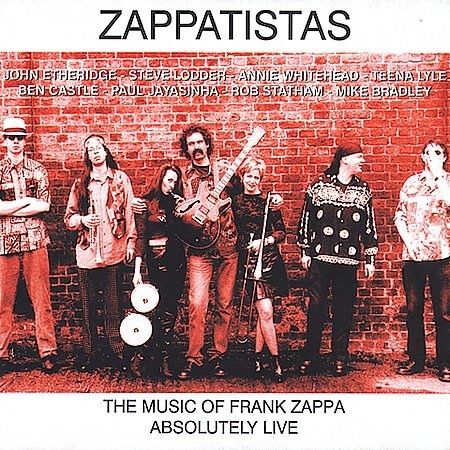 The core of the pieces in this warts-and-all disc originate from Zappa’s late-60s and early-70s material. The set includes a blistering version of “Sexual Harassment in the Workplace” where Etheridge gets to shred in a style previously not heard before. Castle gets to show what he’s made of while the rhythm section grooves away on “King Kong.” The brass section itself is very tight as they capture the raucous nature of the material. Maybe the best rendition from the nine tracks is “Big Swifty,” where the ensemble displays a genuine empathy for the composer’s often twisted, but rewarding pieces. Charts for the gigs were put together by Lodder and feature a brass section that Zappa himself or the Brecker Brothers could love. The most current piece is a cover of “I’m the Slime” from Overnite Sensation, which was popularized on the “Saturday Night Live” program. Taken as a whole, this was but one of a series of hot gigs for an ensemble that knows how to do it right and have fun doing it.